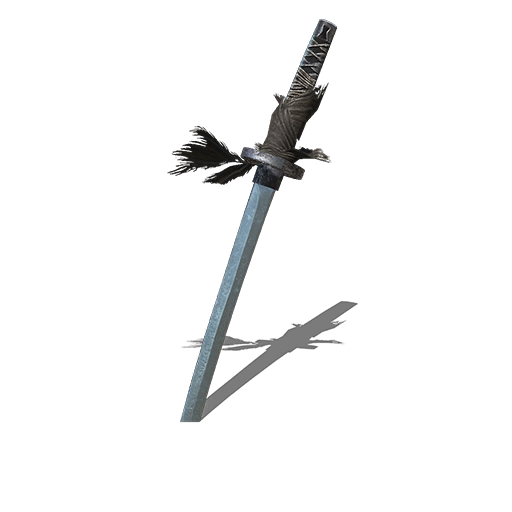 A cursed sword with an unseen blade, the choice weapon of Yuria of Londor. Yuria, a mentor of the Sable Church and accomplished swordswoman, is said to have claimed a hundred lives with this weapon. Aim carefully, and pierce with a large forward lunge. The unseen blade penetrates straight through shields, for nothing can defend from Darkdrift. Dropped by Yuria of Londor. Found at Yuria's location in Firelink Shrine. Only appears after the Lord of Hollows Questline is completed and she is summoned for the Soul of Cinder fight without dying. A returning weapon from Dark Souls II of the same name. The fact that Yuria was "said to have claimed a hundred lives" with it may in fact be a Berserk reference (as is common in the Soulsborne series), wherein the main character Guts became famous for killing one hundred armed soldiers on his own. Unique weapon. Upgraded with Twinkling Titanite. Certain enemies are weak or strong against different damage types. See Weakness for physical reduction, Resistance for elemental reduction. Damage multiplier when performing a backstab or riposte. Value of 100 means no extra damage. Damage multiplier applied to the base value of a spell. This value scales depending on the primary stat of the weapon, i.e. a catalyst with Intelligence scaling will have it's Spell Buff rise as the player's Intelligence rises. By default the value reflected in the infobox and the upgrades uses 60 Intelligence and/or Faith. The Stat Bonuses rating indicates the level of bonus damage you do with the weapon, based on the associated Stat. This rating can be S, A, B, C, D, or E (in order from most to least bonus for the associated skill). See Scaling for more information. A is the Strength stat bonus that influences the physical attack of the weapon. B is the Dexterity stat bonus that influences the physical attack of the weapon. C is the Intelligence stat bonus that influences the Magical attack of the weapon. D is the Faith stat bonus that influences the Lightning attack of the weapon. attacks without breaking guard and reduces the amount of stamina depleted from blocking attacks. The durability of the weapon. over 100% will reduce your regular speed to walking and attempts to roll or backstep will leave you momentarily stunned.